I have empathy for artists who don’t want to be pegged one hit wonders. Since their song “Kids” was such a huge smash, MGMT have moved away from that upbeat dance sound. 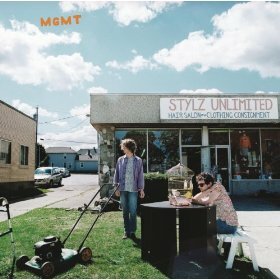 Their sophomore album, 2010’s Congratulations, divided critics and fans, and MGMT is bound to do the same. Halfway through my first listen, I had to go buy a Red Bull to get through the rest of the album. I’m a fan of challenging electro, but MGMT just sounds messy. Most of the vocals are too difficult to discern through the distortion, which just becomes frustrating after a few songs. There are some tracks that managed to hook me. “Mystery Disease” has dramatic synths that contrast well with Andrew VanWyngarden’s calm delivery. “I Love You Too, Death” strips back the chaotic layers to be simplistic and enchanting, like Animal Collective on one of their best days. “Plenty of Girls in the Sea” is a fun track with a dance edge, but the lyrics are eyerollingly trite. While I’m glad that it sounds like MGMT are making the music they want to make without aiming for label approval, MGMT falls stunningly flat. It’s like listening to a petulant teenager claim to be an individual, weird for the sake of being weird. While some moments are worth checking out, they’re not worth the effort of suffering through the rest of the album. Unless you do psychotropic drugs, of course.